Back in December, a good friend visited my studio wearing a crocheted scarf she loves, and asked me to weave three more, similar in length and width. She wanted colors like those in the Lava Flow shawls; since I had some of the hand-dyed yarn from that series left, the project was a go. I felt some reservation about being able to do what was required — these were to be only three inches wide, far narrower than my usual scarves. But she is short, and the female family members she intended two of them for (one for her, of course) are also short. Small-scale made sense. That’s the first one. 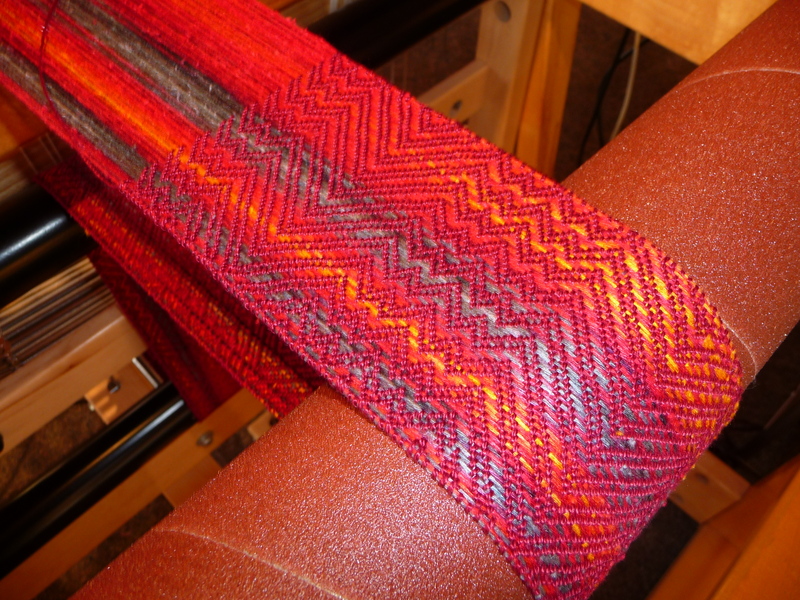 The warp is a hand-dyed silk and rayon blend, slightly textured and with a nice sheen; the weft here is a black tencel. Different pattern, and the weft is a shiny grey bamboo. A different pattern still, and a garnet pearl cotton weft. From start to finish, I cranked these out in five days, named it the Embers series, and my friend came and got them today. She’s so happy with them, she’ll have me do another trio in a couple of months — half as wide. 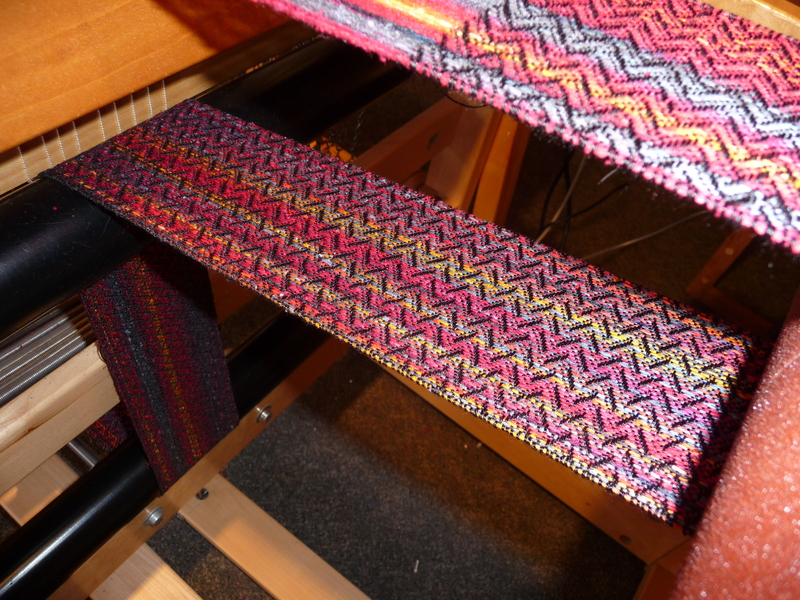 My concern in tackling this commission was that my loom wouldn’t handle the quite-narrow warp very well. That turned out not to be the case. I also worried that weaving something so skinny wouldn’t suit me, as there wouldn’t be enough space for me to play with pattern as I like to do. Also not the case. And I learned something I hadn’t anticipated — the warping process (getting the warp threads onto the loom and ready to weave) went very fast because there weren’t very many of them. 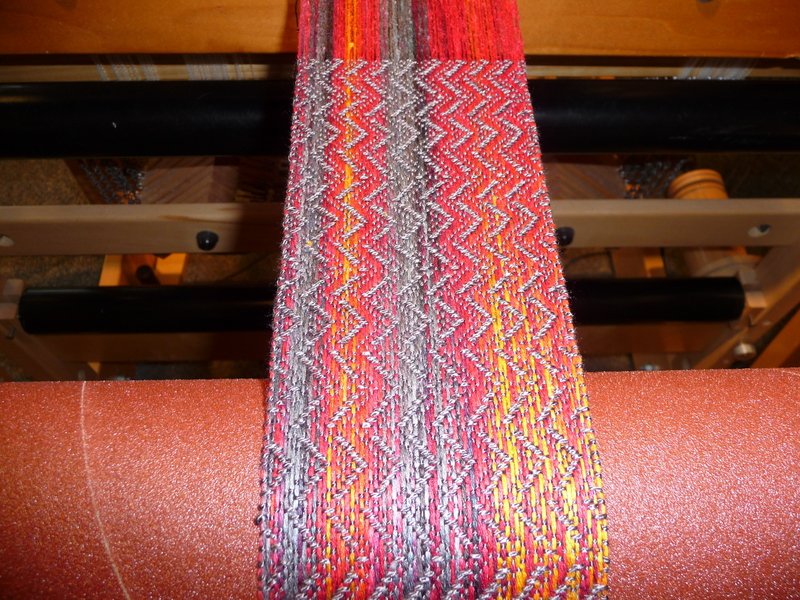 However, the weaving itself took nearly the same amount of time as the wider scarves I ordinarily make, simply because the movements of treadles, shuttle and beater still have to be done as they are for larger pieces. When I do the really skinny ones, I’ll use finer threads, small-scale patterns, and probably learn something new yet again.